Online sales giants have forever changed the way buyers buy. Whether the buyer is a consumer looking for shoes, or a design engineer looking for an actuator, the expectation is that the product they’re looking for is easy to find, with detailed information that makes it easy to evaluate and compare that product with similar and competing products. To a small or mid-sized industrial distributor, competing in the world of online behemoths such as Grainger, MSC and McMaster-Carr can seem a Herculean task. Many simply don’t have the capacity or data needed to build a robust e-commerce presence that delivers the optimal product experience today’s buyers demand. Many industrial OEMs share a similar challenge, lacking the resources to provide their various distributors with consistent, high-quality, up-to-date data. Enter Thomas Connect, a product experience management solution engineered specifically for industry. Built upon a proven industrial product catalog platform that has helped OEMs and distributors sell millions of products and components online, Thomas Connect helps level the online playing field for small and mid-sized suppliers. Thomas Connect is an easy and effective way for you to create and maintain detailed product information, publish it online, and syndicate it to your sales partners. Using data converted from sources such as print catalogs, spec sheets and Excel files, Thomas Connect gives you the control you need to deliver information on the specific products required by each of your various distributors. It enables you to update your product data once, and have it automatically update in real-time across all of your sales channels. If your goal is to supply to larger distributors, Thomas Connect makes it easy for you to deliver data that is verified and optimized to meet the unique product data guidelines of major distributors such as Motion, Kaman, Fastenal and others. Ultimately, Thomas Connect helps you improve interactions with your distributors and buyers by enhancing their online experience with your detailed product data. Thomas Connect enables you to power your website with data supplied directly from the various manufacturers you represent. 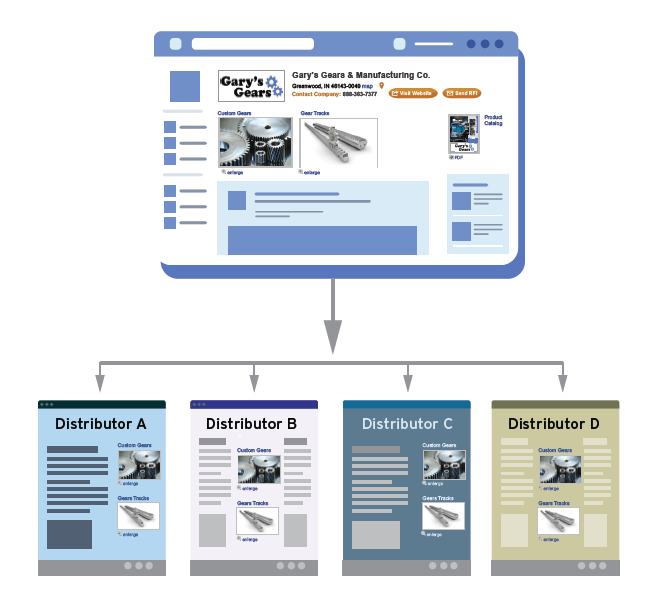 It is a dynamic product catalog solution that integrates seamlessly with your website, and enables your OEMs to automatically populate your catalog with real-time, approved product data that your customers can search, sort, compare and download. 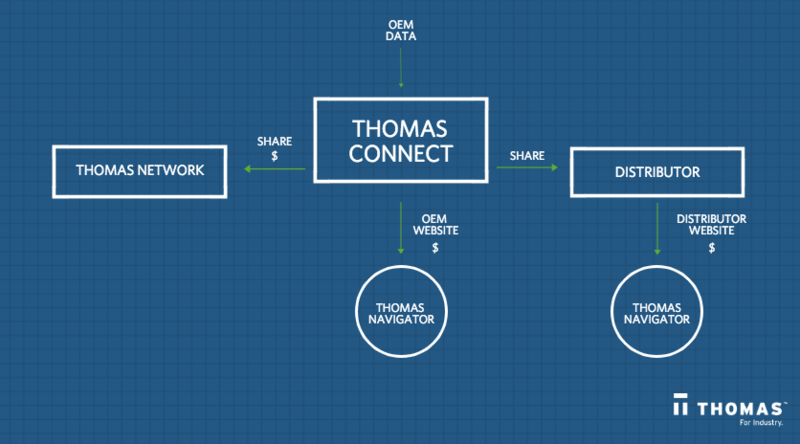 By enabling you to centralize and manage all product data from your OEMs, and present it in a consistent manner, Thomas Connect makes it possible for you to deliver the online product experience today’s industrial/B2B buyers have come to expect. The Amazon effect has made it necessary to step up your online product experience game; Thomas Connect is simply the easiest, most economical and most effective way to make it happen. 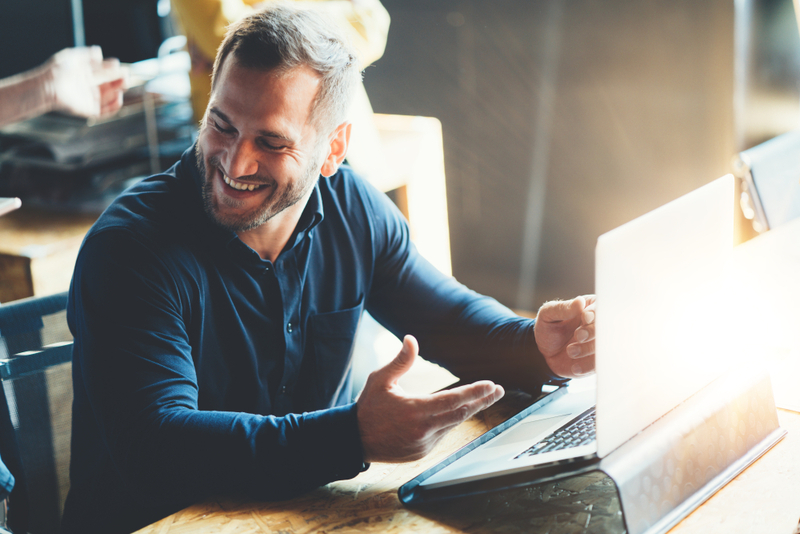 Whether you are a distributor or an OEM, your first connection to a sales channel partner through Thomas Connect is free — sign up now.